The late Dr. Myles MUNROE was an internationally renowned bestselling author of over 70 books, lecturer, teacher, life coach, government consultant, and leadership mentor who traveled to over 100 nations and addressed millions. He met with Prime Ministers, Presidents, Kings, Governors, Congressmen and women, Parliamentarians, Senators, Corporate Executives, Business Professionals, Educators, Scientists, and Religious and Spiritual Leaders from every culture; as well as facilitated training and consultative sessions with governments, businesses, and religious groups. Dr. MUNROE, who passed away last year in a plane crash in Freeport, Grand Bahama along with his wife and several other leaders, was regarded as one of the most highly respected leadership teachers of our era and had recently spend time in Africa visiting nations such as Uganda, Kenya, Burundi, Tanzania, Nigeria, South Africa, Ghana, and Gabon, just to name a few. Throughout the years, he adopted young Africans as mentees to travel closely with him to observe and learn. Among them was Hubert Sugira Hategekimana, a Rwandan genocide survivor who he met at a conference and took under his wings. In the last few years, Hubert has attended conferences, speaking engagements, mentorship sessions, and workshops that Dr. Munroe has done. It was only right that on the day of the first anniversary since Dr. Munroe’s passing, we reach out to Hubert to hear what he learned being so close to the man referred to as, “the leader of leaders”. You could have been on that flight on November 9th, 2014! How does it feel to be in the Bahamas honoring the lives of Dr. Myles Munroe and those he was with on that unforgettable day? Yes, there was a possibility that I could have been on that flight because my friend Diego, who was on the flight and died with them, was urging me to go to Nassau so I could leave with them to Freeport, which is where the conference was being held. However, I had a guest coming to the conference with me. So I told Diego that we would just go to Freeport directly. I was not supposed to be on that flight; but, if my friend was not coming to the Bahamas with me from Ottawa, it was a possibility that I could have been. Tell us of one of the experiences you recall while traveling with Dr. Myles Munroe. I remember one day we were attending a conference in New Jersey, USA where Dr. Munroe spoke, and he received a call from the Speaker of the House of the Bahamian Parliament informing him that the Parliament wanted to honor him. That morning, we had to fly back to Nassau. We landed, went to the Parliament, and he was honored. On the same day, we flew into Charlotte, North Carolina, which was the location of his next scheduled event. I remember thinking that I was the only foreigner who was in the House (Parliament) that day! Those are the kind of things that occurred with Dr. Munroe on a regular basis. Just the other day I was reflecting and even when I think about it now, all I can say is, “Wow! How did I get here?” I spent the last two years of his life going almost everywhere he went. I was even with him in Burundi when we met the President--exactly two weeks before they departed from us. He extended his mentorship to us; he always looked for people who were ready to learn. He understood that success without a successor is failure. So how did all this happen? How did you end up getting a front seat view of this great man’s life and teachings? Dr. Myles Munroe’s passion, vision, and life purpose was to transform followers into leaders and leaders into agents of change, especially in the third world (emerging nations). That’s why he founded the International Third World Leaders Association (ITWLA), the organization which we are a part of and which brings us to this island (Bahamas) each year for the annual Global Leadership Forum. In his pursuit of transforming third world leadership, he had it in his mind to not die with his knowledge, but to pass it on. He was very intentional about mentorship and transferring all he knew and learned to the next generation. That’s the easiest way to explain how and why I was traveling with him. He extended his mentorship to us; he always looked for people who were ready to learn. He understood that success without a successor is failure. He firmly believed that if you didn’t have a successor, you didn’t actually succeed. He also had a mentorship program that I was involved in and after seeing my hunger to learn more, he opened the door for me to be personally mentored. I will forever be grateful for that. It’s one thing to learn from someone speaking but its another thing to learn from observing and watching someone do what they say. I’d say it was destiny that brought me to his side, but he was someone who would mentor anybody that was ready and willing to go through the whole process. Mentorship is a long process that has a price! You have to follow, submit, and obey someone who is mentoring you. Most people in this generation, don’t want to submit to anyone—perhaps, they think they already know it all. Now that he is no longer here, how do you feel about taking on the responsibilities he has left behind? When he and the others who were with him died, there was something that happened--not just to me but to many people he mentored. We [his mentees] are now doing so many amazing things because he trained us so well. I always tell people that I was trained by the best. We didn’t have to stand around and ask, “What now?” When he died, everyone knew what to do. One of Dr. Munroe’s big missions was to transform the third world in terms of leadership development and that’s now where my responsibility lies along with many of my friends that he also mentored. He believed that mentorship is the transfer of passion, responsibility, and vision. He spent his life instilling that into us and perhaps his best mentees: his son Myles Jr. and daughter Charisa are now running Myles Munroe International. Actually, his son was already the CEO, even before Dr. Munroe died; so, he was already in the process of transferring the responsibilities. In fact, they have recently launched the Myles and Ruth Munroe Foundation, which will carry the Munroe Institute that continues the work and teachings of Dr. Munroe. How many people do you think Dr. Myles Munroe mentored? Formally, I would say thousands and informally (by way of his books and materials) I would say millions. I remember when I used to travel with him, people would walk up to him and say, “I’ve read all your books and they’ve helped me build businesses.” In an island-village on Lake Victoria in Uganda, people used the wisdom gained from one of his books on vision [The Principles and Power of Vision] and built schools, an orphanage, and hospital. Now, the government is sending electricity to an island that once had no lights. All of this happened because someone read his book. Dr. Munroe didn’t know this person but they were mentored because of his materials. “An army of sheep, led by a lion will always defeat an army of lions led by a sheep!” For him leadership was very critical. He went further to emphasize that you are where you are in life because someone lead you there. What did leadership mean to Dr. Myles Munroe? Dr. Munroe would say that it took him forty years of research, interacting with leaders, and teaching, to define leadership. In his terms, “Leadership is the capacity to influence others through inspiration, motivated by passion, generated by vision, produced by a conviction, ignited by a purpose”. He had to come up with his own definition of leadership because many people confuse leadership with positions and titles. That’s why he had to explain that leadership is to influence others on the visions birthed by a sense of purpose. He believed that everything rises and falls on leadership. He used to give us the example, “An army of sheep, led by a lion will always defeat an army of lions led by a sheep!” For him leadership was very critical. He went further to emphasize that you are where you are in life because someone lead you there. He also gave an example of a basketball team. If the team continues to lose games, the players are not fired. The coach is always fired because he/she is the leader. Leadership will transform cowards into warriors. 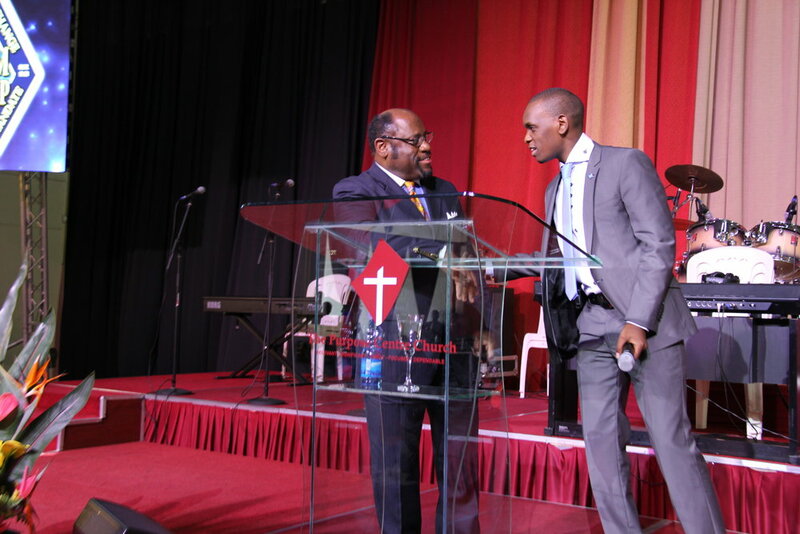 Leadership to Dr. Myles Munroe was the ULTIMATE thing. You have to influence people through inspiration not manipulation. People must be inspired to do things. Leadership is the capacity to deploy people and not employ people. Good leaders employ, great leaders deploy. Leaders push people to become who they really are. What would Dr. Myles Myles Munroe qualify as traits of a good leader? The traits are found in his definition of leadership and to become a leader, you must start from the bottom of the definition and work your way up. First, you discover your purpose. Purpose is why you were born, and why you were created. Then, you are convicted about your purpose. Once you discover your purpose, you must be convinced about it. It is one thing to discover your purpose and another to be convinced. Next, you have vision. Once you are convinced about your purpose, you will produce a vision. You will begin to see a preferred future. Then, you have passion. Once you discover and are convinced of your purpose, you must become passionate about your vision. Finally, you inspire others. Once you are able to motivate and inspire people, you will be able to influence them, which is when they call you a leader. The quality of a leader is first to discover your purpose and to have a vision. Leadership is nothing without a vision. Vision is to see a future as it should be and not as it is. There is only one difference between a manager and a leader. A manager sees things as they are, but a leader sees things as they should be. A leader is someone who sees a better future and is willing to pay the price to bring that future to the present. According to Dr. Myles Munroe, there’s a difference between vision and ambition. Ambition is something to benefit you. A true vision is to benefit not only you and your generation, but generations to come. What is the connection between leadership and legacy? Leadership is seeing a future bigger than you and your life. According to Dr. Myles Munroe, there’s a difference between vision and ambition. Ambition is something to benefit you. A true vision is to benefit not only you and your generation, but generations to come. This is why mentorship is critical in leadership. If a vision is true and authentic, it is bigger than the visionary. That’s why you must mentor people to take on your vision after your life has ended. The greatest act of leadership is mentorship. A vision is never given to a group of people but to one person at a time. The task of a true leader is not just to acquire the vision, but also to define and refine the vision, to write it down and to transfer it to people who will run with it—this is when legacy takes effect, when the baton is successfully passed. Why is legacy so important? Legacy is important because you have to intentionally prepare for someone to take your place. If you don’t think and prepare for your legacy, then it will happen in a way you didn’t want it to happen. When you don’t plan to succeed, then you are planning to fail. Again, success without a successor is failure. The quality of your leadership is not determined while you are still around. The quality of a true leader is what happens in your absence. This is when leadership is proven. Dr. Myles Munroe used to say that his leadership would be proven when he was gone. He would say, “that’s when you will see if I managed to transfer my vision, my passion, and my conviction to the next generation.” This is why he lived for mentorship. There is no legacy without mentorship! Dr. Myles Munroe believed that he was born to transform followers into leaders and leaders into agents of change. That’s how he defined his work.